Casey Hoke – Artist. Speaker. Activist. 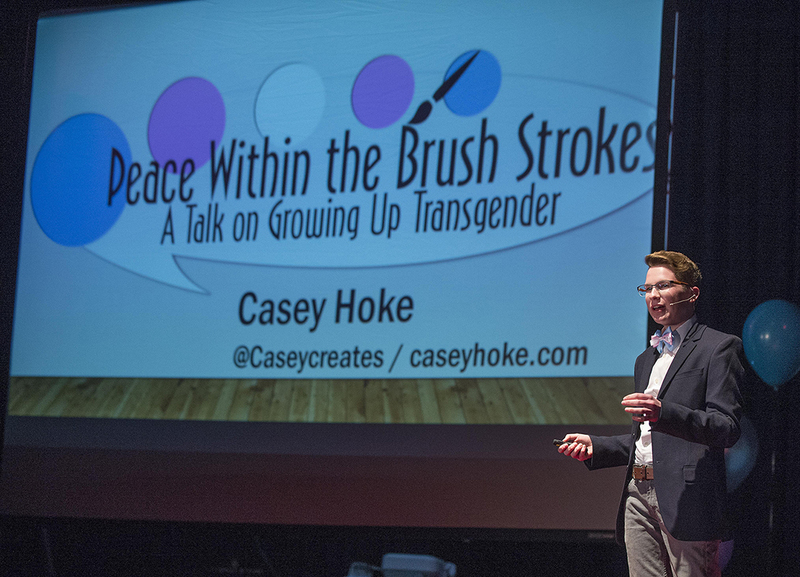 Casey Hoke is a transgender artist, activist, and speaker dedicated to helping others combat marginalization with creativity through his Art, Identity, & YOU workshops, design work, and publications. On August 8, 2018, Casey lost his battle with mental illness. Donations in Casey’s memory can be made to the Pride Center at Cal Poly Pomona. Please enter “Casey Hoke” in the Tribute Information on the donation form. Beginning in middle school as a shy LGBTQ+ activist faced with prejudice from his community, Casey Hoke didn’t expect to have the courage to express himself through his art, writing, and speaking as he does today. After coming out as a transgender male in high school, Casey began to work as an organizer and peer educator at his high school’s Gay/ Straight/ Transgender Alliance in 2014 and served as a student ambassador (2014-16) for GLSEN. With this work, Casey found his voice and began presenting on LGBTQ+ art history and identity in a workshop titled Art, Identity, & YOU , writes for the Huffington Post and MTV News, has given a TEDx Talk, serves as National Executive Board Member for GLSEN, and continues his advocacy and projects along with his college coursework in graphic design and minor art history as a Wells Fargo Point Foundation Scholar.Casey Hoke is currently a 3rd-year student at the California State Polytechnic University of Pomona for graphic design communications and has goals of interning and working with various firms at this time. Please visit his portfolio. What’s Casey up to now? : Working on QueerArtHistory.com , an educational resource for all to learn about the visual storytelling of LGBTQ+ identity through time!